So you’ve got a pretty popular site. Perhaps you have an e-commerce component to your site. Every single person browsing your site is a prospect. You’ve done well – you’ve build a standard compliant site, you invested in making the shopping experience easy and you provide lots of information about your products. It’s not like you’d open a retail store, stock it up, and then have all your staff sit behind the counter waiting for people to bring their products over to purchase. So why do you let people just roam around your site without engaging them? Or making it easier to engage you? This is a huge area and well worth investigating – how can you engage your site visitors more? 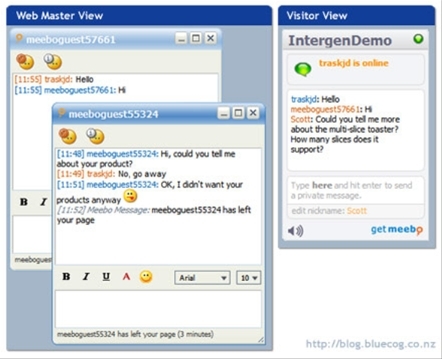 You may recall that earlier in the year I started using Meebo to chat online. It allows you to chat using various networks through a unified rich website (AOL, Yahoo, MSN, ICQ, Jabber). Recently they added an addition to their product line up called “Meebo Me” which is a widget that you can integrate into any HTML page and gives you the power to communicate with site visitors and them the power to communicate with you. All this without needing the site visitor sign-in or register. It’s a fantastic way of communicating with your visitors and letting them ask questions. Users can choose to disable the chat feature if they don’t want it which is useful for those who don’t want to be interrupted. It also shows when the web master is offline and allows end users to give themselves a name. It’s all powered by flash but is slick enough for that not to be a big problem. On top of this you can also see how long a user has been on a page. Perhaps you might want to interact with users if they have been on a page for more than 10 minutes – perhaps they’re thinking about what you’ve written and have a question? It’s just like a retail shop – “You seem to be interested in that product, can I provide any help?”. We’ve come a long way from static pages where users couldn’t interact. At the moment the big deal is being able to control content. The next step is certainly going to be owned by companies that are willing to invest in getting to know their customers. Hey thanks for this JD – I just put it on our business website. Awesome!